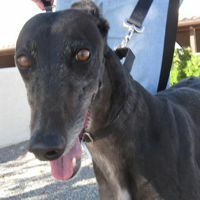 Nyx never raced like her greyhound buddies, but she has retired from her former life as a blood donor. She lived in a loving home after her retirement, but a sudden change in their finances forced the difficult decision to find Nyx a new home. Nyx has a gentle demeanor and greets each person or dog as a friend. Though she follows well on walks, her curiosity will leave her leash in tangles because she wants to explore everything. One look into her captivating eyes and you too will fall in love!